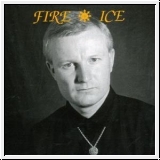 This is the re-release of the first Fire + Ice CD after being out of stock for almost 5 years! Already a classic, it contains tracks that have influenced the world of neo-folk! Here you are able to listen to the true and original songs from Ian Read, the man behind Fire + Ice tracks such as: "Long Lankin," "Corpus Christi," "Blood On The Snow," and the fantastic "Gilded By The Sun"--they speak for themselves!